Even though mining-related uranium (U) pollution in the Wonderfonteinspruit (WFS) has been an ongoing concern since the mid-1960s, media attention has increased considerably recently, focusing on pollution-related health risks that unsettle the general public. In view of recent findings that U might be more toxic than previously thought, such concerns need to be addressed. This even more so as South Africa has embarked on a nuclear expansion programme aimed at, amongst others, extending mining and processing of U. This is Part 1 of a series of papers aimed at the quantification of the extent of U pollution in the WFS, in order to provide a factual base for subsequent risk assessments. This paper provides an overview of recent findings on U toxicity with specific reference to drinking water, together with a critical examination of related international and South African guidelines. Based on a brief description of the study area and the impacts of mining over the past decades, the origin of U from different auriferous ore bodies (reefs) is explored. 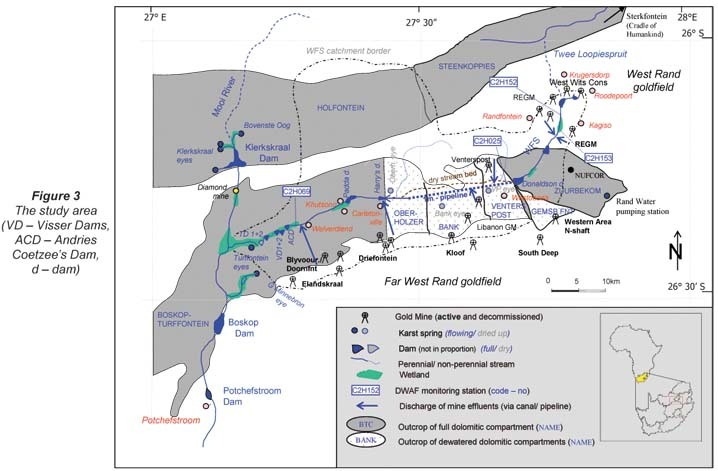 Using secondary data on historic gold and U production in the West Rand and the Far West Rand, tailings deposits in the 2 goldfields are estimated to contain well over 100 000 tons of U constituting a large reservoir for ongoing future U pollution. Apart from tailings, underground water in contact with uraniferous reefs constitutes another major source of waterborne U pollution. This applies to water pumped from underground mine workings as part of the active de-watering of overlying karst aquifers as well as decanting water from flooded mine voids. The discharge of U-polluted water together with largely uncontrolled outflow of uraniferous seepage from tailings deposits are major sources of water pollution in the WFS catchment. With the above headline on its front page, the South African daily newspaper, the Sowetan, in July 2007, drew the attention of its readership to the radioactive water pollution of the Wonderfonteinspruit (WFS) (Avni, 2007). Together with well over 50 articles which appeared between 2007 and 2008 on this topic alone, covering double, full and front pages of local and national newspapers, the article illustrates the degree of media attention that pollution of the WFS has received. Apart from South African newspapers, the issue was also covered by international media such as Al Jazeera, the UN Integrated Regional Information Network (IRIN) and internet-based sources, along with well- known South African TV shows such as Carte Blanche, Special Assignment, Focus, 50:50 and numerous radio broadcasts. Under headlines such as 'Toxic shock' (Potchefstroom Herald, 8 February 2008), 'Lives at risk as mines coin in' (Sowetan, 27 July 2007), 'Uranium dust kills cows' (Saturday Star, 12 January 2008), 'Living in fear of a toxic tsunami', 'Far West Rand residents claim poisoning' (Saturday Star, 12 April 2008) and 'SA radioactive stream  400,000 at high risk' (Stuijt, 2008), some of these articles, often with a certain degree of sensationalism, linked water pollution to a number of serious health effects, unsettling the general public. On the political side, environmental activists prepared special submissions to parliamentary portfolio committees and Members of Parliament, directing enquiries on the WFS issue to the ministers of several departments including Water Affairs, Minerals and Energy, and Environmental Affairs and Tourism (Liefferink, 2007; 2008). Mining-related pollution was also at the heart of several legal actions taken or threatened to be taken by local municipalities, land owners and environmental pressure groups against various gold mines operating in the WFS catchment as well as against governmental authorities for neglecting law enforcement (Van Heerden, 2003a; Bega, 2008). A representative of the Public Environmental Arbiters (PEA), as one of the environmental pressure groups, also approached the Human Rights Commission of South Africa with regard to the WFS issue (Stuijt, 2008). Much of the initial media attention was triggered by the so-called WRC 1214 Report (Coetzee et al., 2006), summarising the results of a research project funded by the Water Research Commission (WRC) of South Africa on the nature and extent of mining-related uranium (U) pollution in the WFS catchment as well as associated risks. Disagreeing with the risk assessment methodology employed and published in the report, the National Nuclear Regulator (NNR), which was represented on the WRC Project No. 1214 Steering Committee, distanced itself from the findings of the report, announcing its intention to conduct its own investigations into the matter. After years of delay this investigation finally took place in December 2006, conducted by a member of the German consultancy Brenk Systemplanung which, during the 1990s, oversaw the rehabilitation of the Wismut U mining area in East Germany. The final report of the study to the NNR, known as the Brenk-Report, identified several sites in the WFS catchment with significant radiological risks, in some cases, exceeding applicable guidelines by several orders of magnitude (Barthel, 2007). With the report distinguishing between 'realistic' and 'potential' exposure scenarios mainly relating to agriculture (e.g. irrigation --> soil --> pasture --> meat --> human) the NNR subsequently analysed selected agricultural products such as meat from local livestock, milk, and vegetables. Examples of elevated U-levels in some of these products (vegetables) fuelled further headlines on imminent health risks (NNR, 2008). While the issue of radioactive pollution in the WFS catchment was first raised as early as 1967 (Stoch, 2008) and has lingered on with varying intensity ever since, it has never before received the degree of public and political attention as it has over the past 4 to 5 years. In response to this, and mounting political pressure, in late 2007, DWAF (Department of Water Affairs and Forestry, now the Department of Water Affairs (DWA)) and the NNR launched a joint initiative to remediate contaminated sites in the WFS, to which end an international specialist task team was subsequently appointed. Based on a methodology developed by Winde (2008), and applied to a limited data pool, some 36 sites along the course of the WFS have since been identified as priority areas of intervention (Iliso Consulting, 2008). The increased awareness of potential dangers associated with U in South Africa coincides with a global renewed interest in U as a climate-neutral source of energy, fuelled by an ever-widening gap between increasing demand and constant supply. Consequently, the U spot price rose tenfold between 2003 and 2007, triggering large-scale exploration efforts to find new U deposits in Africa and Southern Africa, in particular. In South Africa, with its long history of U production, closed gold mines were re-opened to mine U (e.g. Buffelsfontein, Harmony No. 4 shaft at Western Areas, planned for Durban Roodepoort Deep) and infrastructure was established to extract U from the vast amounts of gold tailings estimated to contain a total of some 600 000 t of U (Winde and Sandham, 2004). Furthermore, a dedicated U mine opened near Klerksdorp (Dominion) (it has had to be suspended in the meantime). A need for at least 25 new U mines by 2020 has been predicted, reaching levels comparable to times when South Africa was the 4th largest U producer in the world. With a total of 240 000 t of U3O8 sold, the Nuclear Fuels Corporation of South Africa (NUFCOR) is the largest continuous producer of U concentrate worldwide (Creamer, 2007). Using the momentum of the global nuclear renaissance and capitalising on South Africa's reputation as a reliable U producer, government in early 2007 declared U a 'strategic mineral' and embarked on a nuclear expansion programme (Olivier, 2007). Apart from mining, processing and enrichment of U, this also includes reprocessing of spent fuel elements, and is generally aimed at the development of a nuclear energy industrial complex that creates jobs and reduces the 'over reliance' on cheap South African coal (Hill, 2007a; Zhuwakinyu, 2007). Between 2000 and 2004, South Africa received grants from the International Atomic Energy Agency (IAEA) totalling US$ 4 million for South African scientists and technology practitioners, and 61 out of 800 IAEA projects conducted worldwide in 2006 were conducted in South Africa (Campbell, 2006). In the same year South Africa signed a 5-year agreement with the IAEA aimed at, amongst others, skills development and expansion of nuclear technology, but also at water resource development and integrated pollution control (Moodley, 2006). In an overall antagonistic situation between public perceptions of the dangers associated with U and government's nuclear expansion programme, the latter 2 points, namely, water resource development and pollution control, may provide the 1st steps in finding common ground to curb U-pollution in the WFS catchment. With evidence mounting that the radioactive heavy metal U may pose a more severe health risk than previously thought, even at comparatively low concentrations, a thorough analysis of the extent of U-pollution in the densely-populated catchment of the WFS is needed. This paper is the 1st part of a series of 2 papers which attempts to provide a comprehensive overview of available data in order to quantify the extent of U-pollution in the WFS catchment and provide a perspective for assessing possibly associated health risks. It is hoped that this will improve the knowledge base and provide sound decision support for all parties involved. This paper starts with a brief overview of recent findings regarding the potential toxicity of waterborne U, in order to establish a baseline for assessing to what extent concentrations encountered in the study area may indeed pose a health risk to local residents and downstream water users. This is followed by a short description of natural conditions in the study areas and how they were impacted by deep-level gold mining. The focus of the paper is on source-term characterisation of U pollution in gold-mining areas which may potentially affect downstream water supply systems. This includes an overview of different sources of U, including concentration levels and 1st estimates of associated U loads entering the highly complex karst system. The radioactive metal U is the heaviest, naturally-occurring element on earth. With a global background concentration in the earth's crust of approximately 2 to 4 mg/kg, natural U (Unat) is approximately 1 000 times more common than gold and 10 times more abundant than other (also toxic) heavy metals such as cadmium (0.3 mg/kg) or mercury (0.4 mg/kg) (Turekian and Wedepohl, 1961; Janisch, 1986). Rock types with an elevated U background include granite (3.4 mg/kg) and shales (3.7 mg/kg) (Turekian and Wedepohl, 1961). Displaying multiple oxidation states, U has a comparably complex chemistry resulting in >200 U-bearing minerals (UBA, 2005) and an ability to form soluble complexes with a large range of ions, explaining its exceptionally high geochemical mobility in aquatic environments. Apart from the oxides uraninite (UO2) and pitchblende (a mixture of UO2 and UO3), secondary U minerals such as phosphates, silicates and vanadates are the most commonly mined U ore types, ranging in concentration from below 1 000 mg/kg (0.1% = low grade) to over 5 000 mg/kg and up to 200 000 mg/kg (20%) in some Canadian ore bodies (WNA, 1999). In U-mining areas, where U is liberated from the lithosphere at vastly accelerated rates compared to nature, the high aquatic mobility of U frequently results in large-scale pollution of groundwater and surface water. Like all heavy metals, U is not biodegradable and therefore tends to accumulate in the biosphere reaching concentrations in soil, sediments and biota well above natural background levels. Winde (2003) reports several instances where secondary accumulation of waterborne U in the environment reached much higher levels than in the original source of pollution. Contamination of agricultural soil through long-term, large-scale applications of uraniferous, phosphate-based fertilisers enjoys increasing attention (Schnug and Hahneklaus, 2008). Schnug et al. (2005) link elevated U levels in several municipal water supply systems in Germany, especially in agricultural areas, to such applications (Foodwatch e.V., 2008). Surveys of U levels in bottled mineral waters from different countries found U concentrations as high as 10.6 µg/ℓ and 27.5 µg/ℓ, mainly attributable to U-rich geological settings (Krachler and Shotyk, 2008). For Scandinavia, with its abundance of uraniferous granites, Rosborg et al. (2005) found a maximum U level of 72 µg/ℓ for the Swedish mineral water market, while Asikainen and Kahlos (1979) report close to 15 000 µg/ℓ U and IRSN (2005) even up to 40 000 µg/ℓ in Finnish groundwater. Natural U (Unat) consists almost entirely of 238U (99.3 weight per cent  wt%), which takes approximately the current age of the earth for half its mass to disintegrate through radioactive decay. Therefore, comparably few decay events releasing radioactivity occur during an average human lifespan, rendering the isotope comparably harmless. The 2 other isotopes, 234U (0.005 wt%) and 235U (0.7 wt%), despite making up less than 1% of the Unat mass, account for roughly half of the total radioactivity of Unat (approx. 25.4 Bq/kg). The small trace of 234U accounts for the same proportion of the total radioactivity (48.9 %) as 238U, of which nearly all the natural U consists (ATSDR, 2003). This may be of importance in aquatic environments where recoiling effects disturb the natural equilibrium between 238U and its daughter 234U, by more rapidly dissolving the latter. This, in turn, results in a relative enrichment of the highly radioactive 234U isotope in water. Where radioactivity is determined through measuring 238U concentrations in water and subsequent calculations, assuming equilibrium (as it is commonly practiced using mass-spectrometry such as ICP-MS), this will result in an underestimation of true radioactivity levels in water and an overestimation in solid phases such as sediments. The error margin increases the longer isotopic fractionation takes place. Since reducing conditions further accelerate 234U dissolution, resulting error margins may be significant in cases where anaerobic sediment-water systems are sampled, as was frequently the case in the Wonderfonteinspruit catchment, especially at the highly-contaminated shallow farm dams (Coetzee et al., 2002). Owing to the fact that all 3 isotopes emit only alpha radiation of very low penetration depth (it is absorbed by a few centimetres of air), Unat is of little concern as an external source of radiation. However, this is different when U is ingested and deposited in organs such as kidneys, lungs, brains and bone marrow, where energy-rich alpha particles can directly affect surrounding tissue. In dosimetric calculations a factor of 20 is commonly used to account for the higher biological damage potential of alpha radiation compared to beta and gamma radiation. In addition, the ongoing supply of shorter-lived decay products such as 226Ra or 222Rn with a much higher specific radioactivity further increases U-related radiotoxicity. Triggered by observations of the Departments of Internal Medicine and Community Health of the University of Stellenbosch (Tygerberg Hospital) that a number of their patients suffering from 'significant haematological anomalies, related to leukaemia' came from one particular area around Pofadder (Northern Cape, South Africa), in 1996 a research project funded by the Water Research Commission of South Africa (WRC) was commissioned to investigate a possible link to elevated levels of U and other constituents found in borehole drinking water of this remote arid area (Toens et al., 1998). For any study to detect links between health and groundwater the exposed population need to remain rather constant and stationary for a sufficiently long period of time, using the polluted water as the sole source of drinking water. In contrast to the gold mining areas of the Witwatersrand, where elevated U levels in water were also found (as high as >4 000 µg/ℓ in a public stream Faanhof et al., 1995; Kempster et al., 1996) and where the migrant labour system and other factors result in an overall high residential mobility, the population in the arid farmland around Pofadder largely meets these criteria. Based on blood samples from 418 long-term residents (16 years and older) from 52 locations in the Kenhardt magisterial district (west of 20°E) and groundwater quality data for 69 boreholes in the same area (generated in 1981 through a survey of the Atomic Energy Corporation, AEC), this study, according to its authors, for the first time established a statistically significant, GIS-based correlation between elevated U levels in drinking water from boreholes and abnormal haematological values (high counts of morphologically atypical lymphocytes in peripheral blood stream) linked to leukaemia (Toens et al., 1998). Leukaemia is linked to the biokinetic behaviour of U in humans, in which more than half of the U that can be resorbed from the stomach (commonly not more than 6% of the total amount ingested with the remainder being excreted within 3 to 4 days) accumulates in bones (UBA, 2005) Through direct exposure of bone marrow as blood-generating system to energy-rich alpha radiation emitted from deposited U, leukaemia may develop within 2 to 10 years. The risk of developing bone sarcomas also increases (BEIR IV, 1988, Helmers, 2001). Children are at even higher risk since the continuing growth of bone tissue may allow for higher rates of U-deposition (ATSDR, 2001). It is assumed hat leukaemia development is a unicellular process that can be triggered by malign transformation of only a single cell (BfS, 1998). In a follow-up report to the DWAF, Wullschleger et al. (1998) confirmed elevated U-levels for much of the groundwater used for domestic purposes in other settlements of the Northern Cape. Toens et al. (1998) further suggested that possible links of elevated U-levels to oesophageal cancer observed in the former Transkei (Marais and Drewes, 1962) should also be explored. Links between U exposure and aberrations of the long-lived lymphocytes in humans, as an indication of radiation-related chromosomal damage, have been confirmed by numerous studies investigating survivors of the atom bomb in Hiroshima and Nagasaki, cohorts of U miners, nuclear workers, Chernobyl workers, military personnel exposed to depleted U (DU) as well as civilian residents of DU-contaminated post-war zones (Vahrenholz et al., 1997; Zaire et al., 1997; Streffer et al., 2002; Milacic et al., 2004; Kryscio et al., 2004; Krunic et al., 2005). Tomáek and Malátová (2004) found a total of 30 leukemia cases among 10 000 former Czech U-miners that were statistically linked to cumulated doses of 158 mSv received by red bone marrow (risk: 1 in 333). In a retrospect cohort study involving 23 043 U miners, a total of 177 cases of lymphoma, myeloma and leukaemia (including chronic lymphocytic leukaemia, CLL) were related to radon exposure (Rerecha et al., 2006) (risk: 1 in 130). This challenged the assumption that CLL is not caused by ionising radiation (Hamblin, 2008). Based on 59 000 former Wismut employees in East Germany (the largest cohort of U miners subjected to an epidemiological study to date), Jacobi et al. (1997) points out that for miners in the early mining period (1946 to1955) a significant increase of leukaemia incidences is expected for the period 10 to 20 years after exposure, a period for which unfortunately no epidemiological data are available. Selecting 377 miners out of the Wismut cohort for an individually matched case-control study, Möhner et al. (2006) found a significantly elevated risk between leukaemia and exposure to a combination of gamma radiation and long-lived radionuclides for doses above 400 mSv (risk: 1 in 156). Investigating 407 391 low-dose exposed nuclear workers from 15 countries, Cardis et al. (2005) found a slightly elevated excess risk for leukeamia (other than CLL) and other cancers. For atomic bomb survivors in Japan who were exposed to a radiation dose exceeding 4 Gy the risk to suffer from leukaemia increased by a factor of 15 (BfS, 1998). A full-body exposure to an equivalent dose of 10 mSv statistically results in 200 to 1 000 leukaemia or cancer-related deaths in 1 million exposed people (risk 1 in 1 000 to 5 000) (BfS, 1998). Like most non-essential heavy metals, U is chemo-toxic to humans and has been reported to cause irreversible damage to kidneys (nephrotoxic) if consumed above certain concentrations (UBA, 2005; WISE. 2001). Schnug and Hahneklaus (2008) point to possible links between elevated U levels in increasingly consumed mineral water and the prevalence of kidney cancer. In contrast to essential heavy metals such as Zn which are needed for the human metabolism and only toxic above certain threshold levels, no such benefits of U exist. Ideally U and other non-essential metals and half-metals such as mercury, arsenic or cadmium, for example, should thus not be in the drinking water at all. However, owing to their natural abundance in the environment, the associated costs to completely remove all potentially dangerous metals would render tap water unaffordable to many. Exposing rats to U, IRSN (2005) identified that apart from kidneys the brain is also targeted by U toxicity, possibly being as sensitive as the kidneys. To what extent such neurotoxic effects may cause behavioural changes is still unclear. In this context it is however interesting to note longstanding rumours in the gold mining town of Carletonville (South Africa) linking U-polluted drinking water to an abnormally high number of children with learning problems in a specific mining community that relied on pumped groundwater from the mine (Tempelhoff, 2007; Stoch, 2008: recalling a conversation with a teacher at the Goud Wes School in Carletonville, who remarked that a surprisingly large number of 'slow learners' came from the small Blyvooruitzicht Village. The water supplied to the Blyvooruitzicht community at the time was pumped groundwater from the mine reportedly found unpalatable by visitors). Investigating a group of 29 Gulf War Veterans who retained fragments of depleted U shrapnel in their bodies indicated continued elevation of U levels in urine for several years after first exposure and statistically correlated with lowered performance in neurocognitive examinations (McDiarmid et al., 2000). The maximum urinary U level of 30.7 µg/g detected in this study could be compared to those detected in urine samples from underground gold-miners at Deelkraal Gold Mine (GM) in the Far West Rand (Deelkraal GM, undated), in order to quantify the potential health risk to the miners. IRSN (2005) and Henner (2008) demonstrated that U is also genotoxic causing damage to the DNA of exposed fish. Investigating a population living in a U mining area, William et al. (1995) found such effects also in humans. Recently Raymond-Wish et al. (2007) added U to the long list of known endocrine disruptive compounds (EDC), which are rapidly emerging as a major threat to water quality worldwide. Mimicking the effects of oestrogen in the body, U could possibly increase the risk of fertility problems and reproductive cancers at levels so far regarded as safe in drinking water. However, in view of the large variance between existing U limits for drinking water worldwide, which ranged from the 2 µg/ℓ proposed by the World Health Organisation in 1998 (WHO, 1998) to as high as 1 000 µg/ℓ (Class A quality  no risk) and 4 000 µg/l (Class B quality  permissible, insignificant risk) proposed for South Africa by Kempster and Smith, (1989) and adopted by the DWAF (DWAF, 1993) it appears rather difficult to determine the U level that is actually 'safe'. The fact that the South African value was later adjusted to 70 µg/ℓ (DWAF, 1996a) while the WHO value was raised to 15 µg/ℓ (WHO, 2005) only adds to the uncertainty. Similarly, in South Africa, the upper limit for U in highest quality drinking water (target water quality range: TWQR) is 7 times higher than the TWQR limit for irrigation water (DWAF, 1996 b). Since all limits are aimed at protecting human health with most of them being based on an identical study (91 d U exposure of rats and rabbits (Gilman, 1998a; b cited in Von Soosten, 2008), such variance is often said to result from different allocations of the contribution of drinking water to the total U intake of humans. However, while differing human diets may explain part of the observed variance between the limits (3 500%) it may also reflect the influence of political and economical considerations on the determination of legally-enforceable limits. Another source of uncertainty is an incomplete scientific knowledge base for setting such limits, especially regarding effects of chronic exposure to low concentrations of U typically found in the environment. So far almost all U limits in drinking water are based on data gathered after short-term exposure of animals (experiments). For higher dosages of radioactivity this is supplemented by data from exposure of humans resulting from nuclear accidents and lifespan studies on the Hiroshima atomic bomb survivors (Jacobi and Roth, 1995). Specifically addressing this gap, the French research initiative 'Environhom', for the first time in radioprotection, demonstrated that 'biokinetics and toxicity of radionuclids after chronic exposure may not be simply extrapolated from data acquired after acute exposure' and '... (Results) ... showed that many deterministic effects may be induced after ingestion of small amounts of radionuclids ...'(IRSN, 2005). The limited reliability of existing models is illustrated by the fact that after incorporating additional epidemiological data on effects of internal alpha emitters Jacobi et al. (1997) found a 20 to 70 times higher risk of contracting liver cancer from occupational U exposure than indicated in their previous work which only used extrapolated data from the atomic bomb survivor study. The WHO U limit, as well as those used by the USEPA, Health Canada and the Umweltbundesamt (Federal Environmental Bureau) in Germany, are all based on the nephrotoxicity of U observed in two 1998 studies exposing rats and rabbits for up to 91 d to U-contaminated drinking water (Gilman et al., 1998a; b; Von Soosten, 2008; WISE, 2001). This approach leaves uncertainty, not only regarding the transferability of results from rats/rabbits to humans and effects of speciation other than uranyl nitrate, but also regarding the impacts of exposure times exceeding a 3-month period. The previous WHO limit for U in drinking water (2 µg/ℓ) is now proposed by the Bundesanstalt für Risikobewertung (Federal Institute for Risk Evaluation) in Germany for mineral waters used to prepare baby food, while for drinking water the Umweltbundesamt (German Federal Environmental Bureau) proposes a limit of 10 µg/ℓ for life-long exposure to be legislated in the European Union (EU) (Von Soosten, 2008; UBA 2008; BfR/BfS, 2006; 2007; Konietzka et al., 2005; Dieter, 2000). Both values are significantly lower than those of the US Environmental Protection Agency (EPA: 30 µg/ℓ) or of South Africa (70 µg/ℓ), as 2 major U-producing countries. (In the case of the US-EPA, the originally-determined limit of 20 µg/ℓ was finally set at 30 µg/ℓ to cater for cost considerations in water treatment; WISE (2008)). In this regard Pieterse (1989) stresses the need to distinguish between first assessing the risks associated with contaminants and only then deciding on strategies to manage the quantified risks. Only during the latter aspects should factors such as economic and technological feasibility of removing contaminants from the water be considered. whenever either organisation proposes to initiate a programme or activity on a subject in which the organisation has or may have a substantial interest, the first party shall consult the other with a view to adjusting the matter by mutual consent' (WHO, 1999). Established by the United Nations in 1956 the IAEA was originally tasked to prevent the proliferation of nuclear arms while promoting the peaceful use of nuclear energy. However, according to Bertell (1999), since established the promotional goals of the IAEA frequently took priority over regulatory aspects. This may explain why the U limits set by the WHO were significantly lowered twice during a comparably short period when more U-mining was needed to satisfy a growing global demand. In contrast to most abovementioned guidelines, South Africa's limits for U in drinking water are not primarily based on its chemotoxicity but rather on stochastic cancer risks commonly associated with radiotoxicity. The linear (non-threshold) relationship between the statistical cancer risk and U levels, extracted from DWAF (1996a) water quality categories, is depicted in Fig. 1. The relationship depicted in Fig. 1 is based on the upper class breaking values for water quality categories given by DWAF (1996a) for 238U concentration in domestically-used water and the associated, annual risk of dying from U-related cancer for an exposed population. It indicates that the risk of fatal cancer at a maximum U concentration of 0.89 Bq/ℓ (=70 µg/ℓ; Target Water Quality Range: TWQR) is less than 1: 4 000 000 increasing linearly to 1 in 200 000 for Class 2 water (max. 18 Bq/ℓ to 1 420 µg/ℓ). Extrapolated to accommodate higher U concentrations found in mining areas this relationship indicates an annual fatal cancer risk of more than 1:10 000 if tailings seepage (containing 30,000 µg U/ℓ) were to be consumed (Fig. 1). This example is, of course, purely hypothetical with no reference to reality and is merely used to illustrate the health risk associated with increasing U levels. In contrast, at global natural background levels (0.4 µg/ℓ), only 1 death per year in a population of 1.43 billion people could be related to U, i.e. affecting some 4 people per year globally at current population levels (Fig. 1). The guideline also mentions the risk of renal damage referring to a 'slight' risk increase at U concentrations above 284 µg/ℓ (= 3.6 Bq/ℓ) (DWAF, 1996a). This threshold is, however, almost 30 times higher than the one currently proposed for the European Union, which is also based on nephrotoxicity of U (10 µg/ℓ). Only for U levels exceeding 1420 µg/ℓ (18 Bq/ℓ) are the risks of kidney damage regarded as significant, even if polluted water is used only for short periods (DWAF, 1996a). The WHO reference level for radiation received from the continuous consumption of drinking water for a full year is expressed as annual equivalent dose of 0.1 mSv/a (IWQS, 1999). For exposure of members of the public to combined radiation from all anthropogenic activities the internationally recommended dose limit is 1 mSv/a (ICRP, 1991; IWQS, 1999). It is common practice to restrict the dose a single anthropogenic source may contribute to this exposure. In South Africa the Council for Nuclear Safety (CNS) imposed a limit on such a so-called 'single facility dose' of 0.25 mSv/a (CNS, 1997, IWQS, 1999). This was later adopted by the National Nuclear Regulator (NNR), as successor of the CNS, and is the upper limit of what each operating gold mine in the WFS may contribute to the total radiation exposure of members of the public (IWQS, 1999). (Based on assumed equilibria between all progeny of Unat this dose reportedly includes not only radiation emitted by 238U, 234U and 235U but also that of their respective daughter products ('all nuclide dose'). Instead of referring to different age groups (which differ in vulnerability), this dose is an average for all age groups ('lifetime dose') and is calculated as follows: annual dose (mSv/a) = activity concentration in water (Bq/ℓ) x annual water consumption (ℓ/a) x dose conversion factor (DCF) (mSv/Bq). Annual water consumption is assumed to be 730 ℓ (2 ℓ/d), DCFs for selected radionuclids are listed in DWAF (1996a), e.g. 238U: 7.6 x 10-6 mSv/Bq; 234U and 235U: for each 8.3 mSv/Bq. The highest DCF (1000 times higher than those for U-isotopes) relates to 232Th and 210Po each at 1.2 x 10-3 mSv/Bq). This differs only slightly from the relationship used by the Atomic Energy Corporation (AEC) at the time as a quality control measure for IWQS calculations (Dose (mSv/a) = 0.00124 x U (µg/ℓ) + 0.017; IWQS, 1999). Selecting only those sites interpreted in this paper (29 sites with 755 samples), the relationship between the annual radiation dose and the average U concentration in drinking water was found to be: Dose (mSv/a) = 0.0013 x U (µg/ℓ) + 0.02128, largely confirming the IWQS formula for all 41 sampling sites (Fig. 2). Different guidelines of DWAF exist relating to radioactivity in water and associated fatal cancer risks. In order to compare these guidelines, U concentrations had to be converted into annual equivalent dose (using the above introduced relationship) and vice versa. The results are indicated in Table 1. Comparing U-concentration values resulting from the 2 different guidelines, i.e. the U concentration-based guideline (DWAF, 1996a) and the dose-based guideline (DWAF, 2002), it is noticeable that breaking values separating the classes of water quality differ significantly in some cases. For Class 1 water (best quality) the upper U-limit in DWAF (1996a) is stipulated at 70 µg/ℓ, corresponding to an annual dose of 0.1 mSv/a in DWAF (2002). Converting the dose values into 238U concentrations shows that the upper limit for Class 1 water of 62 µg/ℓ given in DWAF (2002) is slightly stricter that the 70 µg/ℓ given in DWAF (1996 a) (Table 1). However, the associated cancer risks are quite different, being 4 times higher in the dose-based guideline compared to the U concentration-based guideline (1:1 x 106 compared to 1:4 x 106). For Class 2 water (good quality), the upper limit in DWAF (2002) is almost 3 times higher (754 µg/ℓ) than the corresponding value in DWAF (1996a) of 284 µg/ℓ, while the associated cancer risk indicated for this level is 10 times higher than in the 1996 guideline. This variance grows to 20 times for the cancer risk in Class 3 water (marginal water quality), and to over 5 times for the upper U limit in this class (1 420 µg/ℓ compared to 7 677 µg/ℓ; Table 1). The risk given for Class 4 quality water in DWAF (1996a) is more than 200 times lower than indicated in the dose-based guideline. While differences between chemotoxicity-based and radioactivity-based guidelines are common (e.g. the difference between the WHO guideline for U of 15 µg/ℓ is comparable with the radioactivity-based WHO limit of 0.1 mSv/a equalling 62 µg/ℓ) this cannot explain the variance between the 2 DWAF guidelines since both apparently relate to radioactivity-related carcinogenic effects of U. In situations where radioactivity is not the only or the dominant stressor but acts in conjunction with other factors such as malnutrition, air pollution, chemical and bacteriological water pollution, even larger knowledge gaps on health effects through U exposure exist. This is of particular concern since U was found to be immunotoxic (adversely affecting the immune system), observed in chicken lymphocytes exposed to low concentrations of uranyl nitrate (Shukla et al., 2007). In view of the prevalence of HIV infections and AIDS in many of the mining towns of the study area (following the outcomes of a medical investigation Carletonville was apparently dubbed 'the AIDS capital of South Africa', Stoch, 2008), such U-related impact on humans could further strain the already compromised immune systems of many residents. Other stressors particularly affecting poor communities in informal settlements include the lack of basic infrastructure such as safe water supply and sanitation (which indirectly promotes the use of contaminated water from unsafe sources), poverty-related stress, substance abuse and inadequate access to much-needed health care. Under such scenarios 'safe' U levels may need to be set significantly lower than those appropriate for less vulnerable populations elsewhere. In conclusion, it appears that the hazard potential of U is particularly high due to the combination of its exceptionally high mobility in the aquatic environment and its large range of chemo-toxic and radiotoxic properties (or a combination of both), many of which have not been known when currently applied drinking water limits were determined. The WFS catchment is shown in Fig. 3. The lower part of the catchment is underlain by highly weathered and compartmentalised dolomite forming discrete karst aquifers known as dolomitic compartments. Separated from each other by near impervious, north-south trending syenite and dolorite dykes, these compartments used to feed large volumes of dolomitic groundwater via karst springs into the WFS, as reflected in its Afrikaans name ('miraculous fountain stream'). Most of the groundwater is stored in the upper 40 to 100 m of the outcropping Malmani dolomite, termed the 'cavernous zone'. This zone consists of a network of caves and cavities interconnected by solution slots, underground channels and fractures totalling a storage capacity which exceeds that of the full Vaal Dam (the 2nd largest dam in South Africa) several times. The dolomite is 2.6 billion years old and has been subjected to exceptionally extensive karstification illustrated by the presence of the 5 longest surveyed caves in Southern Africa and the abundance of karst springs (so called 'eyes') which are amongst the strongest in Southern Africa (Swart et al., 2003a ;b). Originating just south of the sub-continental divide, near Krugersdorp, the stream-bed of the approximately 90 km long WFS runs for some 80 km over outcropping Malmani dolomite before finally joining the upper Mooi River. Draining a catchment area of some 1 600 km², the WFS runs through 2 major mining areas (termed 'goldfields'), the so-called West Rand (WR), covering almost the entire headwater region, and the Far West Rand (FWR, also known as West Wits Line or Carletonville goldfield) in the lower central part (Fig. 3). Gold mining commenced in the area as early as 1887, just 1 year after gold was discovered some 25 km east at the present day Johannesburg. The West Rand up until 1992 produced a total of 1 990 t of gold, mainly from small bands of auriferous conglomerates (termed 'reefs') embedded in outcropping quartzites of the Witwatersrand Supergroup. These weathering-resistant rocks form part of an east-west running range of hills known as the Witwatersrand (Afrikaans for 'ridge of white waters'), after which the basin with the richest gold deposit on earth was named. Owing to large volumes of dolomitic groundwater pouring into newly-sunken shafts, gold reefs further downstream could not be accessed for a long time, as they were covered by dolomite up to 1 500 m thick. It was only in 1934 that the Ventersdorp GM, aided by a newly invented cementation process, successfully sunk a shaft through the water-bearing dolomite. This initiated the rapid development of the Far West Rand goldfield where some of the world's richest goldmines, such as Blyvooruitzicht and later West Driefontein, were soon to be. Up until 1992 the area produced some 7 700 t of gold from 5 different reefs mined at depths of well over 3 000 m below surface (Robb and Robb, 1998). Encountering ever-increasing volumes of dolomitic groundwater in underlying mine workings, several deep-level gold mines in the FWR proposed to 'de-water' selected dolomitic compartments in order to reduce inflow and the associated (high) costs of pumping the water back to surface. After a 4-year study on possible consequences of such de-watering, the South African Government granted permission to the mines to de-water specific compartments (Jordaan et al., 1960). De-watering was affected by the mines through pumping out more water from underground than the karst aquifer received as natural recharge, thereby gradually lowering the groundwater table by up to 1000 m in places. Consequences of the large-scale de-watering included the drying up of 4 karst springs with a total discharge of approximately 135 Mℓ/d as well as of many boreholes in the area, seriously impeding thriving irrigation farming. While this was expected and economical consequences taken into account by government when granting the de-watering permit, there were also dramatic, unforeseen consequences including the occurrence of catastrophic sinkholes swallowing whole buildings and claiming people's lives (Swart et al., 2003b). Furthermore, many sinkholes had formed right in the stream bed of the WFS diverting large volumes of stream water directly into the underlying mine void thereby defeating the purpose of de-watering. In order to counteract the increased recharge, in 1977, the WFS was diverted out of its original stream bed into a 32 km long pipeline of 1 m diameter (commonly referred to as '1m-pipeline') carrying the stream across the 3 de-watered compartments (Venterspost, Bank and Oberholzer) to the non-de-watered BTC (Fig. 3). From here on the WFS runs for the last 35 km or so in former irrigation canals and its original stream bed. In order to accommodate the large volumes of water generated during the de-watering phase, the original stream channel was enlarged to prevent adjacent farmland, often bordering directly on the river banks, from being flooded. The artificially enlarged stream channel became known as the mid-stream canal. However, after regular cleaning of the mid-stream canal was abandoned in the late 1990s the channel soon silted up to such extent that water overflowed the banks generating large areas with open water along the course of the canal. Apart from higher evaporation losses this may also increase seepage into the underlying BTC. Currently all mines together pump an estimated total of 140 Mℓ/d back into the WFS (Winde et al., 2006). This is in addition to pumped groundwater used for internal purposes such as tailings disposal and domestic use. Stoch (2008) estimates the total pumping volume for all 4 de-watered compartments to be 242 Mℓ/d. In addition to impacting on the surface hydrology through the drying up of springs, diversion of streamflow and a significant reduction of surface runoff rates in sinkhole areas, deep-level gold mining also irreversibly changed hydrogeological conditions underground. Apart from significantly lowering the groundwater table of up to 1 000 m in places, mines also penetrated previously impermeable dykes which used to hydraulically separate neighbouring compartments. With a total of more than 43 km of tunnels and haulages running through the Oberholzer, Bank and Venterspost dykes, mining hydraulically linked 4 previously separated compartments (derived from Swart et al., 2003a) (Fig. 3). The non-de-watered BTC is now connected to 3 de-watered compartments upstream forming a single 'mega-compartment'. In the event of future re-watering, the final water level in this mega-compartment would be controlled by the elevation of the lowest-lying natural outflow point, which at 1 395 m a. m. s. l. is the Gerhard Minnebron (GMB) Eye, followed by the lower and upper Turffontein springs (approx. 1 410 m a. m. s. l. and 1420 m a. m. s. l., respectively) (Fig. 3). Projecting this level across the upstream compartments, the water table would remain several tens of meters below its original level preventing the dried up dolomitic springs from flowing again. It would also mean that the GMB Eye as lowest lying and strongest spring of this mega-compartment would be a major decant point for highly-polluted water emanating from a mine void several times larger than the Western Basin. Where found at levels well above natural background levels in the WFS catchment, U mainly originates from mined gold reefs (ore bodies), where it is frequently associated with Au. It mainly occurs in minerals such as uraninite and brannerite or together with leucoxene with an average concentration of approximately 100 mg/kg U3O8 (Cole, 1998; Wymer, 1999). U concentrations for selected reefs found in the WR and FWR are listed in Table 2. In addition to reefs listed in Table 2, U may also be found in the Black Reef, especially where it overlies the auriferous sediments of the Witwatersrand Supergroup as is the case in the WR, where this reef was mined in open pits. With some of the other uraniferous reefs also outcropping at the West Rand, a certain degree of (spatially very limited) pre-mining U dissemination by natural erosion seems to be possible. This, however, is not true for the Far West Rand where all reefs are covered by several thousands of meters of dolomite and lavas which are practically U-free. Outcropping strata which may contain slightly elevated U levels that may locally increase the natural background value for U are granites and black reef sediments at the northern edge of the study area (Hartebeesfontein anticline, downstream of Klerkskraal Dam) as well as Karoo sediments and Pretoria Group shales at the Gatsrand as southern border of the WFS catchment (Erasmus, 2008). As part of the current (3rd) renaissance of U mining and production in South Africa, exploration efforts are underway to find unexplored U reefs in the WR, specifically targeting old shafts at DRD, Rand Lease GM and East Champ d' Or. Additionally it is planned to mine U-rich remnants of exploited reefs underground as well as unmined U-reefs with low gold grades (Seccombe, 2007). Possible contributions to elevated U-levels by application of uraniferous phosphate fertilisers have not yet been reported for the area. It is unlikely that this source could change the overall U-balance significantly given the fact that commercial crop production (i.e. fertiliser application) is spatially limited and associated U loads are small in comparison to those from mining sources. However, on a more local scale, for heavily-fertilised areas which are not exposed to mining pollution via slimes spills, contaminated irrigation water or wind-blown dust from nearby slimes dams, the application of uraniferous phosphate-based fertilisers may well be a significant U-source. Tailings: The vast deposits of milled and leached ore (tailings) are by far the single largest source-group of water pollution in both goldfields (SRK, 1988; Marsden, 1986).Compared to U ore mined elsewhere in the world, concentrations found in the WR and FWR are regarded as low-grade. However, owing to the fact that U at only average concentrations was generally not extracted from the ore, gold tailings frequently display the original U ore concentrations, which frequently exceed those in tailings from genuine (low grade) U mines elsewhere. In contrast, tailings from gold mines in the area which produced U as a by-product may contain comparatively little U since the employed extraction technology (sulphuric acid leaching) had an average efficiency of some 90%. Between 1952 and 1995 a total of 4 mines in the WR goldfield produced close to 28 000 t U from the Main, Composite, Monarch and Elsburg Reefs. This compares to 11 300 t in the FWR, mined between 1952 and 1988, by 5 mines, exclusively from the Carbon Leader Reef (Cole, 1998). However, tailings generated by U-producing gold mines before and after active U extraction display above-average U levels. Since many tailings in the West Rand were deposited well before large-scale U production commenced in South Africa (1952), this part of the catchment is particular prone to tailings-related U pollution. As part of a 5-stage governmental Uranium Programme a total of 19 U plants commenced production across the Witwatersrand goldfields within a period of just 4 years (Stuart, 1957). Of the 4 U plants erected during the first stage, 2 were located in the study area, namely: West Rand Consolidated Mines, Ltd. (October, 1952) and Blyvooruitzicht G.M. Co. Ltd. (April, 1953). Moreover, the first pilot flotation plant was constructed at Blyvooruitzicht (July, 1946), followed 3 years later by South Africa's first pilot U plant (October, 1949). The pivotal role Blyvooruitzicht appears to have played during the initiation of the large-scale U production programme may, according to Taverner (1957), be based on an incorrect determination of U levels in a 100 kg screening sample of ore from this mine (presumably from the Carbon Leader reef). Presumed to have been determined as 5 000 mg/kg U3O8 it was subsequently shown that the actual U level was less than a third of this concentration (Taverner, 1957). However, with approximately 1 600 mg/kg this would still be one of the highest U grades ever mined in South African gold ore, retrospectively justifying the initial focus on this mine. During stages III and V of the U programme another 3 U plants commenced production in the area viz. Randfontein Estates G.M. Co. Ltd. (February 1954, also treating ore from East Champ d'Or G.M. Co. Ltd.); Luipaardsvlei Est. and G.M. Co. Ltd. (November, 1954) and West Driefontein G.M. Co. Ltd. (March 1956, also treating U ore from Doornfontein G.M. Co. Ltd.) rendering the FWR a prime U production area (Stuart, 1957). In younger slimes dams of the FWR, where most mines only started after World War II, U-rich tailings are likely to be confined to upper layers of slimes dams deposited after U-production was abandoned in the 1980s. At this time the Carbon Leader reef, as the only reef from which U was produced in the area, was largely mined out, leaving comparably little tailings material of above average U grade (145 mg/kg) to be dumped onto slimes dams. Data on U production obtained from the Chamber of Mines (CoM) in 1999 (Whymer, 1999) deviate slightly from the abovementioned but are in the same order of magnitude (Table 3). Based on data on amounts of milled ore and extracted U reported by the individual mines to the CoM (Wymer, 1999), the average U concentration in tailings of the different mines has been calculated (Table 3). In practice, however, actual U levels found in different slimes dams of these mines may deviate significantly from these values depending on whether U-depleted tailings or tailings with original U levels or both have been deposited and, if so, in what proportions. With the exception of East Champ d'Or which only produced a small amount of U, the tailings of all other U producers in the WR display U levels well below those found in non-U-producing mines (<50 mg/kg compared to 100 to 200 mg/kg). The effect of U extraction on U levels in tailings is, however, less clear in the FWR, where the occurrence of very low-grade U ore at non-U-producers and mixing of U-rich tailings at U-producing mines prevents such clear distinction. With a total mass well exceeding 1 billion t (993 million t in 1999, plus ongoing production since then): Kloof and Driefontein alone produce some 10 million t/a of tailings resulting in some 100 million t for the period 1999 to 2008; GFL, 2008), gold tailings deposited in the WFS catchment over the past 122 years would contain an estimated 100 000 t of U3O8 (approx. 98 000 t in 1999 plus uraniferous tailings added since then) of which approximately two-thirds are located in the FWR. Owing to revived interest in U production recently, many of the slimes were drilled and the contained U resources re-estimated. In the WR most of the uraniferous slimes dams belong to Harmony GM and Durban Roodepoort Deep (DRD), owning 54 000 t and 15 000 t of contained U3O8, respectively (Seccombe, 2007). This results in close to 70 000 t U in the WR alone. With an average U concentration of 215 mg/kg, Harmony's Cooke slimes dam next to the WFS is one of the highest grade U tailings deposits, containing some 19 000 t U3O8. Calculated at a spot price of US$150/kg U3O8 (in June 2007 it peaked at US$270/kg), this slimes dam alone was worth ZAR 1.4 billion (Hill, 2007b). Meanwhile the U spot price came down significantly to around US$ 80/kg while the long-term contract price is currently at about US$ 120/kg (Campbell, 2010). Based on recent drilling data, Goldfields Ltd. (GFL), as largest operator in the FWR, estimates the amount of U contained it its 14 slimes dams (SD) at 24 000 t. Together with some 20 500 t U3O8 generated by current underground operations, GFL alone owns close to 55 000 t U3O8, almost all of which is located in the WFS catchment (Creamer, 2009). Adding to that the U contained in unexplored slimes dams of the WR (only 11 out of 54 slimes dams owned by Harmony were drilled) as well as the FWR (no data for slimes dams owned by AngloGold Ashanti, which partly also drain towards the WFS and other GMs such as Elandskraal and Blyvooruitzicht), the total mass of U in the 2 goldfields is likely to well exceed the 100 000 t estimated based on earlier data. Since SDs in the FWR were often deliberately placed on outcropping cavernous dolomite to facilitate drainage, released U poses a direct threat to groundwater in underlying karstic aquifers. Although 'de-watered', all dolomitic compartments are still between 40% to 60% filled with water (Swart et al., 2003b). In contrast to the FWR, where slime dams are commonly well maintained in terms of erosion control (although there are exceptions), the old and often abandoned tailings deposits (not only slimes dams but also sand dumps) in the WR are frequently heavily eroded and tailings are washed into nearby stream channels and wetlands of the WFS system. In some instances, washed-off tailings have completely filled former mine water reservoirs (return water dams) such as the Tudor and Lancaster dams. Tailings accumulated in the latter to such extent that they were recently mined. With waterborne erosion of tailings facilitating easy access of oxygen to the widely dispersed tailings material, sulphide oxidation (acid mine drainage) readily occurs and liberates U together with other trace elements and salts directly into the stream water passing through these dams. Even though the WR contains only one third of the total U mass deposited in the whole of the WFS catchment, at an overall much lower average concentration than in the FWR (71 mg/kg vs. 126 mg/kg), its potential for direct stream pollution may well be higher than in the FWR. Compared to the FWR where slimes dams are scattered over a comparably large area and often located well away from the stream, tailings in the WR are spatially more concentrated and often border directly on floodplains, wetlands and stream channels of the WFS. Together with significantly steeper topographic gradients in this hilly headwater region (gradients of 6.7% vs. 0.18% at lower reaches), dominance of low-permeability bedrock and higher (orographically-enhanced) rainfall, the potential for waterborne erosion of tailings into the fluvial system is higher than in the comparably flat, dolomitic areas. Stream pollution in the WR is further aided by overall low levels of maintenance and erosion control especially at old, abandoned slimes dams. A moderating effect may be associated with the fact that the tailings were exposed for prolonged times to chemical weathering allowing for oxidation fronts to penetrate deeper than in the younger and better maintained tailings dams in the FWR. With associated leaching already continuing for tens of decades, a certain proportion of the contaminant reservoir is now exhausted, reducing the overall potential for future stream pollution. Compared to the WR, direct tailings-related stream pollution in the FWR is less pronounced while large-scale impacts on groundwater are more common. The latter is particular problematic where sub- or adjacent sinkholes allow for contaminated seepage, surface run off, and/or tailings material itself to be directly injected into the dolomitic aquifer. The spatial distribution of slimes dams in the WR and FWR in relation to the WFS and sinkholes is shown in Fig. 4. Driven by rapidly rising U prices, several gold mines in the WR and the FWR recently received offers from various national and international interest groups to sell their uraniferous tailings dams for U extraction. For a long time seen as an environmental liability, this turned many slimes dams into assets, and illustrates their above-average U grade to which in the past little, if any, reference was made (Hill 2007a; b; 2008). While reworking old SDs certainly removes most of the contained U and in some cases pyrite too (used for producing sulphuric acid), attention should be given to the possibility that the commonly applied, high-pressure hydraulic liquidation of tailings and the associated input of large volumes of water may trigger or accelerate the movement of possibly existing pollution plumes underground. Higher source concentrations of U generally create steeper geochemical gradients as a key driver for environmental U dissipation. They are, however, not the only factor governing the actual load of waterborne U emitted by slimes dams. Parameters such as the acid generation potential (i.e. the ability to generate sulphuric acid through oxidation of sulphides subsequently leaching U from tailings particles), the technical water balance (active slimes dams have continuing slurry water input while decommissioned slimes dams do not, some may receive water for irrigating vegetation covers, etc. ), the climatic water balance (rainfall volume and intensity vs. evaporation losses), the hydraulic conductivity of the slimes dams (depending on grain size distribution, presence or absence of covers, etc. ), the extent of erosion control measures limiting the access of oxygen to inner tailings, and the presence or absence of liners and drains, to name but a few, also control the actual pollution potential of tailings deposits. While erosion of slimes dams by wind and water physically transports uraniferous tailings particles into the environment and only affects the surface of tailings, geochemical leaching of U from tailings particles into the porewater, and its subsequent transport along with seepage out of the deposit, is not confined to the surface and commonly affects much larger volumes of subsurface tailings. In contrast to erosion, where mixing of the eroded tailings material with unpolluted sediments and soil of the receiving environment increasingly reduces U levels away from the source, this is not necessarily the case with dissolved U. Triggered by changing geochemical conditions, for example, U may be removed from the water phase and re-concentrated in associated sediments, soils and salt crusts to levels exceeding source concentrations. While the rate at which U is leached from tailings usually increases with decreasing pH values of the porewater, U mobilisation  unlike that of many other heavy metals  is not confined to acidic conditions and may also occur in neutral and alkaline environments, albeit at lower rates. The potential of gold tailings to generate U-polluted seepage is illustrated by experiments conducted in the 1970s aimed at stimulating quasi-natural (bacteria-aided) in situ leaching of U from slimes dams. Mrost & Lloyd (1970) report concentrations of dissolved U in acidic porewater of artificially-oxidised tailings of up to 150 000 µg/ℓ. Winde et al. (2004) found U levels of up to 30 000 µg/ℓ in seepage collected in a toe dam of an abandoned, decommissioned slimes dam in the Klerksdorp area. Owing to the very fine-grained nature of tailings and associated low hydraulic conductivity, as well as a strongly negative climatic water balance in most South African gold mining areas, it is frequently argued that little vertical water movement occurs in slimes dams. This, however, is contradicted by observations in de-watered areas of the FWR where slimes dams situated on cavernous dolomite soon developed sinkholes. At one particular SD at Doornfontein GM, which was placed on 2 large pre-existing sinkholes, more than 50 sinkholes occurred thereafter (Stoch, 2008). Since the formation of sinkholes is linked to free-flowing water that percolates through the unsaturated zone and removes fine material into an underlying karst receptacle, the preferred occurrence of sinkholes under slimes dams suggests that significant volumes of tailings seepage flow out of SDs. In de-watered areas of the FWR, seepage from slimes dams may, however, be frequently sucked into underground de-watering cones of mines. This, in turn, contaminates the pumped groundwater as well as the WFS as receiver of the discharged pumping water. For the 1.5 km²-large Cooke SD in the upper part of the WFS a minimum outflow of some 7.3 Mℓ of seepage per day was calculated (AED, 2006). This equates to almost 1 800 mm/a of water  close to triple the amount of rainfall in the area. This illustrates the degree to which active slimes dams may act as sources of waterborne U-pollution. Metago (2003) predicts U-levels of 340 000 µg/ℓ for leachate from tailings used to fill sinkholes in dolomites of the FWR. In addition to tailings seepage, surface runoff, in which highly U-enriched salt crusts covering many slimes dams in the area are dissolved, also constitutes a significant source of waterborne U pollution. At a slimes dam in the lower FWR area such a tailings crust was found to contain over 600 mg/kg U, exceeding U levels in the underlying tailings. Being readily dissolvable on contact with (rain) water, first flushes of stormwater following rain events are likely to be highly contaminated with U, carrying large loads of the metal into the fluvial system (Winde et al., 2008). Rock dumps: Although often perceived as largely U-free, a recent study in the Klerksdorp Goldfield revealed that runoff from rock dumps contained up to 670 µg/ℓ U, and is thus comparable to seepage from tailings (Labuschagne, 2008). To the knowledge of the author, no similar data for rock dumps in the study area are available to date. Underground ore bodies: Parts of uraniferous reefs not mined due to their low gold content also pose a potential source of U pollution. Since uraninite, as the most common U-bearing mineral, is not stable in the presence of oxygen, areas where such ore has been exposed through mining present a potential source of underground water pollution. Apart from service water used for dust suppression, cleaning, etc. this may also contaminate infiltrating dolomitic groundwater. Furthermore, in post-mining flooding scenarios where acidification of mine water additionally promotes U liberation from rocks, such ore bodies may constitute long-term sources of U pollution. Apart from exposing U reefs through mining, the natural leaching of reefs by groundwater that moves in cracks and fractures through such ore bodies may also lead to higher U levels in pumped water from underground. Owing to so called 'fracture envelopes', typically surrounding mine void structures such as haulages, stopes etc. caused by blasting, drilling, mining triggered seismicity (several thousands of tremors per day) and other mining-related mechanical stress on underground rocks, such water movement is often enhanced around mine voids. Decanting mine water: In the early 1990s, after more than a century, deep-level gold mining finally ceased at the West Rand and a system of interconnected underground voids of the different gold mines, totalling an estimated volume of 125 million m³, started to gradually fill up with naturally infiltrating groundwater and surface water (Winde et al., 2006). After mines eventually discontinued the pumping of underground water in 1998 (which was discharged into the Twee Lopie Spruit that drains via the Limpopo towards the Indian Ocean), in August 2002, highly-polluted water from the mine void started flowing out of boreholes and old shafts into low-lying areas and streams on the surface (AED, 2006). Initially displaying pH values below 2, and U levels of up to 16 000 µg/ℓ (Coetzee, 2008), the large volumes of this water (15 to 35 Mℓ/d (Coetzee, 2008)  flowing into the Twee Lopie Spruit East) had devastating consequences for associated habitats and water quality of the receiving stream. Shortly after the start of the decant, drastically increased mortality of several game species in the nearby Krugersdorp Game Reserve through which the streams run were reported (Du Toit, 2006). Soon after the devastating effects of the decant on the small stream became evident, the DWAF ordered Harmony GM as owner of the property where the decant occurred, via a Directive, to divert a maximum of 15 Mℓ/d of this water into the WFS. However, as part of current efforts to rework many of the old tailings dams for U and Au, a non-profit company (Western Basin Environmental Corporation) was established by the mines, which now pumps and pre-treats at least 15 Mℓ/d of the decant water to be used in the reprocessing of slimes. After being used in the extraction process, the water is treated again, and sold to industrial users via the 'Western Utility Corporation'. Possible clients include the platinum mines, which currently suffer from water shortages in the dry Rustenburg area some 80 km away (AED, 2006)(Regarding the discharge of U-polluted mine water from the Western Basin it should be noted that during the 1980s the Randfontein Estate Gold Mine (REGM) de-watered flooded sections of its mine void in the Western Basin in an effort to revive U-mining from the White and Monarch Reefs. Subsequently large volumes (estimated at 40 to 60 Mℓ/d) of presumably highly U-polluted mine water have been pumped into the Twee Loopie Spruit East, possibly also affecting the karst water in the Steenkoppies Compartment over which the stream water eventually runs. In view of such large volumes of highly U-containing water entering cavernous dolomite to what extent dolomitic groundwater in the Steenkoppies Compartment has been polluted should be explored (Fig. 3). Not clearly separated by cross-cutting dykes, a possible U influx from the Steenkoppies Compartment into the Hohlfontein Compartment should be investigated, which may explain the elevated U 'background' levels found at Bovenste Oog. While such impact would require U-polluted water moving against the topographic gradient, large-scale irrigation pumping present in the area, and the associated lowering of the groundwater table, may have partly reversed hydraulic gradients possibly allowing for U-plumes to move westward). The mine void of the FWR goldfield is significantly larger than the one of the WR, while displaying reefs of similar U levels. (Predicted to be in the order of some 600 million m³, planned deepening and extension projects may significantly increase this volume.) An unmitigated decant event like that in the WR could therefore have disastrous consequences for the water supply of Potchefstroom as well as the general environment downstream of the potential outflow points. With an additional discharge of more than 100 Mℓ/d (about the original flow of the dried-up springs) of highly acidic water (pH < 2) and similarly high U levels as those observed in the WB, initial U loads of more than a ton of U per day (at 10 000 µg U/ℓ) would enter the Mooi River system. Pumped water from underground mines: Apart from U-containing ore, water pumped from underground mine workings may also act as source of contamination. Depending on the location of uraniferous reefs, volumes and quality of ingressing water (termed 'fissure water') and contact times, significantly different U concentrations in mine water may be found at different depths (levels) and areas of the mine void. While some fissure water is nearly pristine and can be used for domestic purposes without further treatment (as is the case at Driefontein GM), other fissure water at the same mine shows U concentrations of over 5 000 µg/ℓ (COMRO 1991). An even higher concentration was found at Deelkraal GM in fissure water pumped from below 9 Level, containing over 11 000 µg/ℓ U (238U) (COMRO 1990). (Based on urine samples from 484 randomly chosen mine workers it was found this (high U level) corresponds with higher urine concentrations of U in miners working below 9 Level, some displaying concentrations as high as over 50 µg U/ℓ. At the Nuclear Fuels Corporation of South Africa (NUFCOR), workers displaying U levels of this magnitude are removed from the workplace until U levels subside (Deelkraal GM, undated). Compared to U levels reported for urine samples taken from 1 518 German citizens between 2001 and 2003, that were found to range from 0 001 to a maximum of 0.32 µg/ℓ (UBA, 2005), these levels are well above normal. Exposure of mine workers mainly results from the consumption of chilled service water used as a cooling agent underground, which contains as much as almost 4 000 µg/ℓ U at Deelkraal GM and 20 000 µg/ℓ U at West-Driefontein (COMRO, 1990; 1991; Pulles, 1991). While it was first assumed that this practice may have contributed to very high U levels of 1 300 to 13 000 µg/ℓ found in toilet drains of changing rooms at several gold mines (Pulles, 1991), this is unlikely to be the case given the exceedingly high U levels. According to Erasmus (2008), in some mines process water from the metallurgical plant is running continuously  i.e. no flushing is required  through sanitary systems including toilet drains before eventually flowing into the sewage plant and being discharged. This is more likely to be the actual cause of the high U levels found in toilet drains and also explains why Slabbert (1996) considers sewage effluents as a major source of U-pollution in discharged mine effluents. Apart from tailings seepage and uraniferous ore, secondary U enrichment in scales of water pipes may also act as a pollution source for underground mine water, especially where recirculation allows for extended contact time between the uraniferous scales and the water (Fouche, 1998; Wendel, 1998). U accumulations in fluvial sediments: Over time, immobilisation of U from polluted stream water led to the accumulation of U in fluvial sediments reaching levels of up to 1 600 mg/kg in cases (Wade et al. 2002). 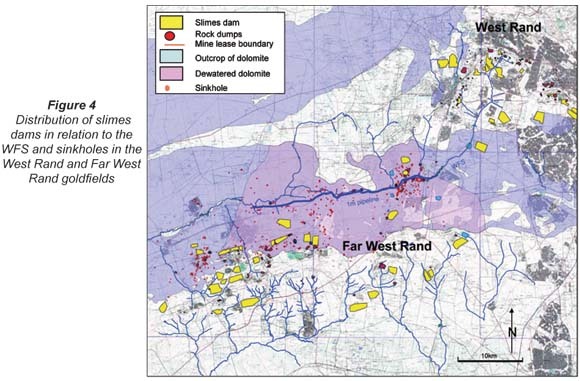 While the latter was found in sediments of the Tudor Dam, which to a large extent consists of eroded tailings rather than sediments of truly fluvial origin, organic-rich sludge deposited in shallow farm dams in the lower WFS (downstream of Carletonville) displayed U levels of several hundred mg/kg, well exceeding U concentrations in most tailings of the area (Coetzee et al., 2002). With Wade et al. (2002) and Coetzee et al. (2002) proposing that sediment-bound U may be released back into the water through environmentally plausible changes such as acidification and oxidisation, the city council of Potchefstroom filed a notice of motion at the Pretoria High Court against Blyvooruitzicht GM on 23 December 2002 when one of the farm dams (A Coetzee's Dam, ACD) was found to be drained, exposing the highly contaminated sediments to oxidisation and the Potchefstroom water supply to possible U pollution (Van Heerden, 2003a). Although the dam was actually drained by its owner to access the gold which accompanies the U, the gold mine accepted responsibility and agreed to an out-of-court settlement while undertaking to repair the breached dam wall and to monitor U levels (Van Heerden, 2003b). Results from this monitoring programme will also be presented in Part 2 of this paper (Winde, 2010). To date it remains unclear whether, and if so to what extent, U can indeed be remobilised from these sediments and if so under what conditions. With much of the current public and media attention focused on these highly polluted sediments and regulating authorities pondering their (costly) excavation, this question urgently needs to be answered. In an attempt to quantify the extent of the U pollution in sediments, Goldfields Ltd. funded a high density survey of the lower WFS with core sampling (WAG, 2007). The results largely confirmed the findings of previous studies pointing to shallow farms dams dotted along the course of the WFS as the most polluted sites. Recent findings regarding the toxicity of U significantly extended the list of possible adverse health affects humans may suffer as a consequence of prolonged exposure to above-background levels of U. Apart from the long-known nephrotoxicity (kidney damage), on which the majority of international U guidelines is based, a surge of research triggered by the DU-related 'Gulf War Syndrome' and newly-available large cohorts of former U miners from East Germany and Czech Republic extended the list of possible adverse health effects of U. Data from animal experiments as well as epidemiological data now suggest that U may not only be nephrotoxic but also neurotoxic (targeting the brain), genotoxic (causing DNA damage related to cancer) and may disrupt hormone balances by mimicking oestrogen at levels below currently existing drinking water limits. This is of particular concern since drinking water limits for U in South Africa were found to be well above international standards. Furthermore, a considerable degree of variance exists between concentration- and dose-based limits as well as the associated risk estimates. Of particular concern are findings of a 1997 South African study which links naturally elevated U levels in domestically-used groundwater to increased incidences of haematological abnormalities related to leukaemia amongst residents of a Northern Cape farming community. While causal relationships between ionising radiation in general and leukaemia are well established for above-average exposed populations such as U miners, nuclear workers and lately also residents of DU-contaminated war zones, no such link was previously reported for the drinking water pathway. In view of these findings, public concerns about U pollution in the WFS catchment are to be taken seriously even though some concerns may have been exaggerated and sensationalised in the media. This may include a need to revisit the guideline value for U in South African drinking water which, as far as could be established, is currently the highest worldwide and for more than a decade now regarded as 'tentative' only (DWAF, 1996a). All major sources of U pollution in the study area are mining-related, with U originating from auriferous ore (reefs), where it is commonly associated with gold. Tailing deposits in the WR and FWR alone contain well over 100 000 t of U3O8 constituting large, long-term reservoirs from which U migrates, largely uncontrolled, into adjacent environs. As one of the geochemically most mobile heavy metals, U moves rapidly from a multitude of mining-related point and non-point sources into the aquatic environment, polluting stream water as well as groundwater contained in large karst aquifers. Apart from local residents this also affects the water supply of a downstream community of some 250 000 people. Rates and mechanisms of mining-related water pollution differ somewhat between the mined-out West Rand and the still active Far West Rand goldfield. While U pollution in the non-dolomitic WR directly affects the fluvial system via erosion of, and seepage from, adjacent tailings deposited in close proximity to the stream, pollution in the karst area of the FWR primarily affects the groundwater. However, in the de-watered parts of the dolomite, much of the tailings seepage and the polluted groundwater is drawn back into the underground mine workings from where it is pumped into the WFS. Therefore, groundwater pollution in the FWR indirectly also causes the pollution of the fluvial system. Highly polluted acidic water flowing from flooded mine voids constitutes another major source of waterborne U pollution, mainly in mined-out areas. Owing to a much larger void volume in the FWR, a similar uncontrolled decanting of mine water, as experienced in the Western Basin, and unmanaged re-watering of the 4 de-watered compartments could have drastic consequences for downstream water users such as the Potchefstroom municipality. Owing to deepening projects that many gold mines recently decided to embark on, this scenario may, however, only be realised several decades from now. This leaves sufficient time to address the issue of re-watering and its associated consequences in a comprehensive and responsible manner.